My church and I have commenced a 21 Day Fast starting Jan 4, 2016 although I started on the 1st personally and we are on day 5 of the Fast. I shared a message last night with our members still on the topic of King Hezekiah. Listen, if you read my Prayer for 2016 you will have noticed that King Hezekiah started to restore righteousness in the church (temple) with the people of Jerusalem since the previous King Ahaz had made a mess of things by introducing idols into the temple, stopping the practice of people bringing their tithes and offerings into the Storehouse…and the list goes on. The end result of all that mess was that the people suffered desolation and trouble because they denied their worship to the ONE true God. [ Ahaz Reigns in Judah ] Ahaz was twenty years old when he became king, and he reigned sixteen years in Jerusalem; and he did not do what was right in the sight of the Lord, as his father David had done. I remember telling our members that You become what you worship. If you worship a singer (e.g. Michael Jackson)…you’ll imitate his mannerisms, dance style, clothing style etc to the point that you’ll look exactly like him…I’m using him as an example because I’ve seen fans…and then I’ve seen FANS…..extreme fans that is. I’m not saying that it’s wrong to like someone’s abilities…but don’t make them your god. There is a fine line between mere admiration and worship. Don’t cross the line. If you worship Jesus, in the same way, you will become like Him in your mannerisms, speech, and appearance. Choose today whom you’ll serve/worship because this year has a strong correlation to worship. What you worship in this year will determine the way you end your year (if you make it that is). I know what I’m saying might not seem cosy for your heart right now…but I feel led to address some stuff that are pretty much black and white with no gray areas for you to feel doubt about what I’m saying. God is interested in RIGHTEOUSNESS being restored this year and it all begins with YOU. King Hezekiah started the first Month of the year with cleaning out the temple with the help of the Levites and the priests. 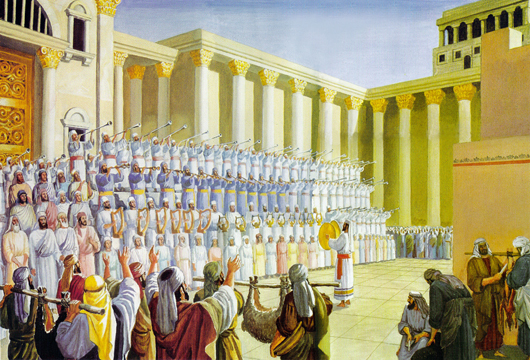 The Levites ended up being more sanctified than the priests and ended up taking up tasks that should have been the job of the Priests but because they had not finished going through that process of purification and sanctification, the Levites who were always in a state of sanctification started to take on more work to clean God’s house. You can read all about it in 2 Chronicles Chapters 29-31 for yourself. If you are a worshiper, this is the level in which we as Christians should reach. Consecration is what God is seeking from us this year…to be in right-standing. In no way am I saying that this is an easy task…but the truth of the matter is…we need to go back to that place where churches start talking about the importance of HOLINESS again. I don’t know why the message of Holiness has been silenced, but as a person hearing the heart-beat of God, I know this is what He wants restored for the year 2016 with His People. If you want Jesus to be your God, then you have to want to be His people. Anyway, back to the message I spoke last night: Hezekiah did all he could to set the people of Jerusalem back on the right path by restoring the foundation of righteousness and faith that was broken among the people because of the mess left by the previous King Ahaz. He (Hezekiah) as a leader made GOD important to the nation by putting Him First and because he did that, King Hezekiah prospered in all that He did and had the Lord’s attention. 2 Chronicles 31:20 – 20 Thus Hezekiah did throughout all Judah, and he did what was good and right and true before the Lord his God. 21 And in every work that he began in the service of the house of God, in the law and in the commandment, to seek his God, he did it with all his heart. So he prospered. In this year you will face a fierce battle if your agenda is to restore righteousness in your life and in the life of the church. This message isn’t intended to make you feel fear, because fear is not of God, but what God showed me through the passage below that I have pasted From 2 Chronicles chapter 32 is that the King of Assyria is like a person who comes out to mock you, harass you, threaten you, undermine you and what you stand for. Such a person will even boast of how they stole your opportunities, stole your house, car, wife, husband, children or any blessing you had in your life because they are filled with so much pride and arrogance simply because they are ruthless and they don’t care what they do to get ahead of you in life. The devil doesn’t play around people… so WAKE UP! You cannot afford to be complacent this year…you have to learn to FIGHT the good fight of FAITH. If you purpose in your heart to go back to that place where you humble yourself before God, you will be victorious in the battles that you face. 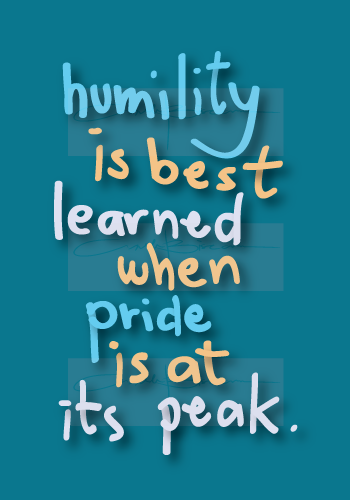 REMEMBER: HUMILITY IS POWER UNDER SELF-CONTROL. It is the place you set yourself aside (even when you don’t have to) and allow God to step in. The question is, how many people do that these days??????? It’s the question of the day I tell you. 32 After these deeds of faithfulness, Sennacherib king of Assyria came and entered Judah; he encamped against the fortified cities, thinking to win them over to himself. 2 And when Hezekiah saw that Sennacherib had come, and that his purpose was to make war against Jerusalem, 3 he consulted with his leaders and commanders[a] to stop the water from the springs which were outside the city; and they helped him. 4 Thus many people gathered together who stopped all the springs and the brook that ran through the land, saying, “Why should the kings[b] of Assyria come and find much water?” 5 And he strengthened himself, built up all the wall that was broken, raised it up to the towers, and built another wall outside; also he repaired the Millo[c] in the City of David, and made weapons and shields in abundance. 6 Then he set military captains over the people, gathered them together to him in the open square of the city gate, and gave them encouragement, saying, 7 “Be strong and courageous; do not be afraid nor dismayed before the king of Assyria, nor before all the multitude that is  with him; for there are more with us than with him. 8 With him is an arm of flesh; but with us is the Lord our God, to help us and to fight our battles.” And the people were strengthened by the words of Hezekiah king of Judah. 16 Furthermore, his servants spoke against the Lord God and against His servant Hezekiah. 17 He also wrote letters to revile the Lord God of Israel, and to speak against Him, saying, “As the gods of the nations of other lands have not delivered their people from my hand, so the God of Hezekiah will not deliver His people from my hand.” 18 Then they called out with a loud voice in Hebrew[d] to the people of Jerusalem who were on the wall, to frighten them and trouble them, that they might take the city. 19 And they spoke against the God of Jerusalem, as against the gods of the people of the earth—the work of men’s hands. 20 Now because of this King Hezekiah and the prophet Isaiah, the son of Amoz, prayed and cried out to heaven. 21 Then the Lord sent an angel who cut down every mighty man of valor, leader, and captain in the camp of the king of Assyria. So he returned shamefaced to his own land. And when he had gone into the temple of his god, some of his own offspring struck him down with the sword there. 22 Thus the Lord saved Hezekiah and the inhabitants of Jerusalem from the hand of Sennacherib the king of Assyria, and from the hand of all others, and guided them[e] on every side. 23 And many brought gifts to the Lord at Jerusalem, and presents to Hezekiah king of Judah, so that he was exalted in the sight of all nations thereafter. The humility King Hezekiah demonstrated in this attack is based on the kind of relationship he had with the Lord his God. God wants us to have this level of humility this year so that when you do face a crisis or a series of crises, you will have a strong head on your shoulder to seek His face to help you win the battle that you face. You cannot rely on previous methods with the types of attacks that may come in your life this year. LEARN TO LEAN ON JESUS. And whoever exalts himself will be humbled, and he who humbles himself will be exalted. People will/may harass you during this year – they will poke fun at your faith and mock your God. They might even write about you to their supervisors to tempt you to strike back in anger. Your role is to not give in to the harassment. Have self-control and know where you stand. God wants to do New things with us this year but you have to be open to instruction, love mercy, act justly and pursue wisdom. You cannot afford to react the same way to the same attack in the year 2016. Therefore, if anyone is in Christ, he is a new creation; old things have passed away; behold, all things have become new. Very powerfull, I will share it on tuesday prayer and bible study. I’m glad this post blessed you Anthony. This is truly the WORD OF THE LORD. I thank God for you. This word resonates LOUDLY AND CLEARLY in my heart. This is a word of confirmation. I must print this out and put this in my journal. This is a STRATEGIC WORD. This is the word for 2016. the spirit of passivity is in a lot of the churches now. This whole thing started with worship and it will end with worship. There is a false gospel being preached where man is the idol. God simply exists to give you everything you want. He has been reduced to a spiritual bell hop just standing by to give us everything we want. Name it and claim it. Gab it and grab it. All types of methods to get what you want without relationship with God. The Gospel of Christ is seldom preached. Let alone messages about repentance, holiness and righteousness. What a refreshing timely word. There is a spiritual demarcation. I can here the Holy Spirit saying “Who is on the Lord’s side, let him come unto me. Your points to remember are awesome. I am going through what you have said right now. The cross before me, the kingdom within me, the world behind me, no turning back. Wow. Praise God. Continue to pursue Him and God will continue to pursue you, find you, and take you to where He wants you to be. Stay Blessed sis. Hazel. God is up to something BIG in your life. It is all about timing, it is time for you to take a step in faith in this matter, yes you are very busy but seek the Holy Spirit on how to prioritize your time the way “He wants” You must slow down and be still. God deals with me a lot with timing, so he will send me to his children with a word of encouragement to say, it s time for you to move on this or seek me specifically about this or that. I have never forgotten your wisdom, God wants to use you. And BTW. God is your provider, everything that is for you already exist right now! What is for you will get to you, no one can hinder it except you. Remember faith and patience will inherit his promises. You are called individually, with an individual measure of unique talents, time and resources to accomplish the will of God in your life. I am hearing that you need to get more rest, stillness from busyness so you can hear him clearly. Don’t feel overwhelmed cause it is by his power and ability that is within you by his Spirit. You will minister to your generation.